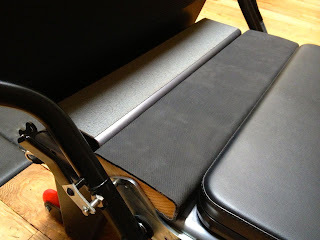 As a pilates trainer who has used and taught on Lagree's Proformer and Megaformer, Stott, and WundaBar Pilates Reformers, I was not happy with the lack of front padded platform extender for the Allegro Reformer. I already own the rear platform, but for my clients, the front one would be most useful. I wanted to add new pilates exercises to their repertoire. Balanced Body does NOT make one. 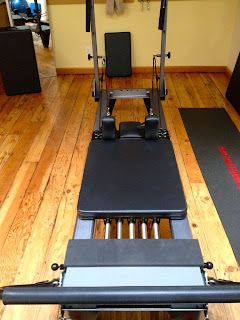 Recently, at the 2013 IDEA World Fitness Convention, I got to use the Stott V2 Max Plus Reformer with the padded platform (selling for $185.00) for four days straight, and when the convention was over, I simply could not let it go. What to do? I already had the Allegro and, for the time being, I didn't want the expense of switching over to the functional V2 Max, mainly because of a platform. I asked a handy friend for help. Two days later, voila! I got my own custom made front padded platform extended for the Allegro! 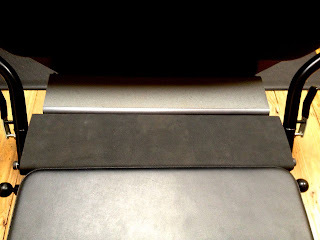 I have been using it for just one week and all my clients love it! 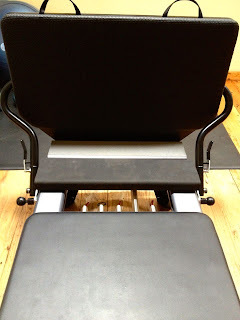 It's padded yet firm, stable, has good traction, and allows even those who are "balance challenged" to climb on top of the machine for front and rear facing lunges, pikes, splits... so many exercises that we have yet to explore together. So, for those of you trying to locate a front padded platform for your Allegro Reformer or your Allegro Tower of Power, stop looking. I doubt that Balanced Body is going to bother to make one, not since the release of the Allegro II, which is now their main focus. Feel free to contact me if you would like one custom made for your Allegro. 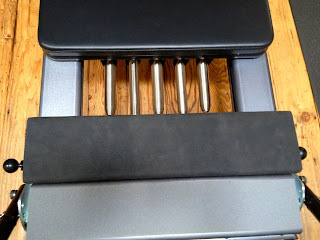 Email me at: info(at)pilatestransformer.com, or you may leave a comment here. Please include your location, city and state. At a colleague's suggestion, I decided to place an ad on Craig's List. I wanted to advertise my Pilates Home Studio. I shared a few photos, used my general location, and posted under the "lessons and tutoring" section. Craig's List was completely automated and user friendly, so I finished my ad fast, uploaded it, and then received a confirmation email. Silly me, I didn't even notice the bottom instructions from Craig's List: It was Safety Tips and Avoiding SCAMS. I would love to share with you just a few of the many emails I received in response to my ad. I am pasting them here. I did not change a word! I will like to know if you can be taking my daughter your lesson. Sent from my Android phone on T-Mobile. The first nationwide 4G network. Hello, How are you, can you take my Son you lesson perfectly while am at work? To this one I responded, "Yes, I can." Just for kicks. Not a word from arianna59ok yet. I was checking on craigslist and i came accross your post. I'm Aaron Wilson and My wife's name is Emily Wilson. We are relocating to your neighbourhood from England. I recently got a contract with a company on a private research job with minimum of two years contract and possibility of extending the contract. However, I need someone who will help me to take care of the house by doing some house work while am off to work. Someone that will also help in running some errands or babysitting. My financier will be making out a check to you before our arrival, you will be receiving an overpayment bank check which you will deduct your pay for the first two weeks and you will be using the remaining to buy foodstuffs, art galley, home appliance and other things needed in the house. You will be getting this foodstuff on the day of our arrival which will be the 20th of Next month. Actually our flights from England will arrive at nights so you will be getting the foodstuff in the morning and making all other preparations. I have a better idea. How about I pay YOU $500 per week to do your wife's training and errands? Any children in the family? Because if there are, I can also happily babysit, anytime day or night. As a matter of fact, why wait? Why don't you and your family come stay at my house until your sale goes through. Send me your personal info and I'll send you the keys.Mi casa es su casa. her back home after the lesson. Brilliant Ms. James also pasted a link to the agency she mentioned in the body of her email. Well then, she MUST be for real. I'm emailing her my social security number. 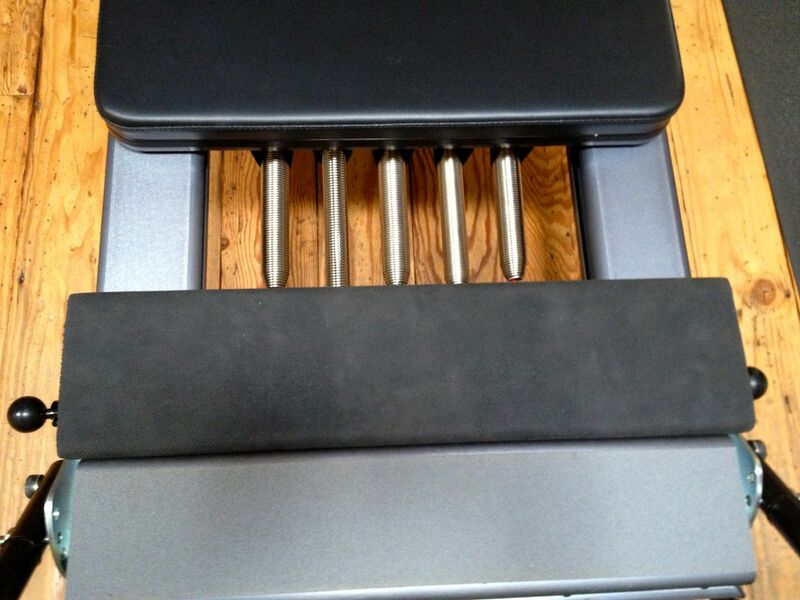 To sum it up, I would NOT recommend Craig's List as a method of advertising a pilates trainer. As much fun as I had reading some emails, I ended up wasting my time. Luckily, Craig's List takes unpaid ads down in seven days, so at least I saved a bit of time on that end. I just let my ad expire. I'm so smart! I asked someone to quickly tape me as I was working on QUADRUPED JUMPING at my pilates home studio. I liked the results so much, that I didn't want to change a thing--besides my hairdo. In the video that follows, I have done a brief sequence of four point kneeling simple jumps on my Balanced Body jump board on the Allegro Tower of Power. While not for beginners, a client needs only understand the basics of neutral spine and be able to practice proper alignment while maintaining it. Before I start with the jumping, I have worked on my alignment, length between the crown of the head and the tail bone, open collarbone position, and finally using my breath I have also stabilized my spine using the muscles around my core. Time for a couple of updates. First, I did a little remodel in the past couple of weeks and I am happy with the new look of the studio. Check out the Allegro Tower of Power, the fabulous Reformer, the jump board, and more: Pilates Studio Photos! One more thing. 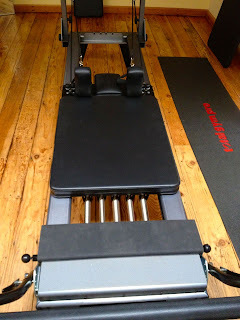 My Pilates studio has a new listing on a fabulous new directory: www.pilatesplaces.com. 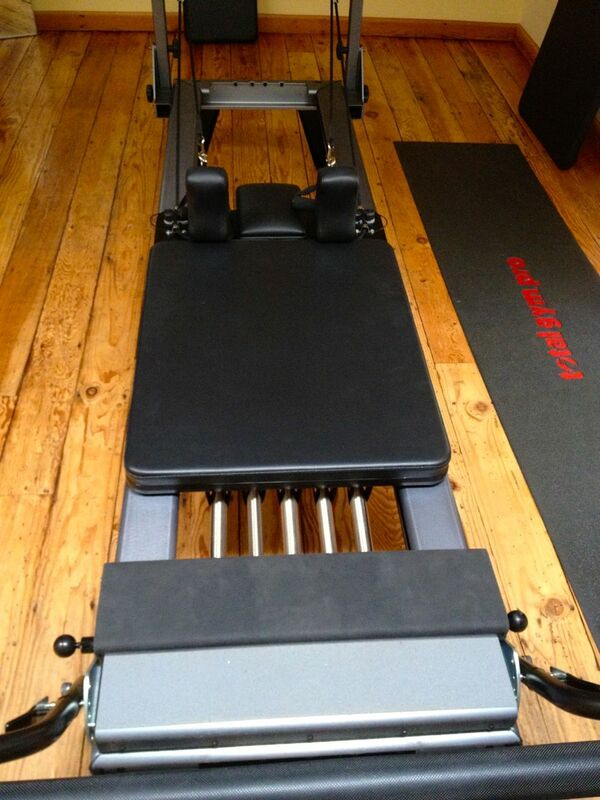 Check out my listing: Pilates Transformer and don't leave before checking out the entire site! IDEA Health & Fitness Association recently launched FitnessConnect, the largest online directory for fitness professionals, connecting trainers to 16 million consumers. IDEA FitnessConnect, is a powerful new platform linking fitness professionals, certification verification, partners, and consumers. There's a new theory that abdominal crunches, the Pilates Hundreds included, are potentially harmful to the pelvic floor. As a responsible Pilates Trainer (who also teaches specialized pelvic floor, pregnancy and post partum classes), I can see why this thought has some merit: As the pressure in the abdomen rises, the pelvic floor muscles, the "hammock" located between the bony landmarks of the pelvis, may sustain extra pressure and potentially weaken. It is obviously clear that the urogenital diaphragm hangs in limbo if neglected. Well, how about cueing then? 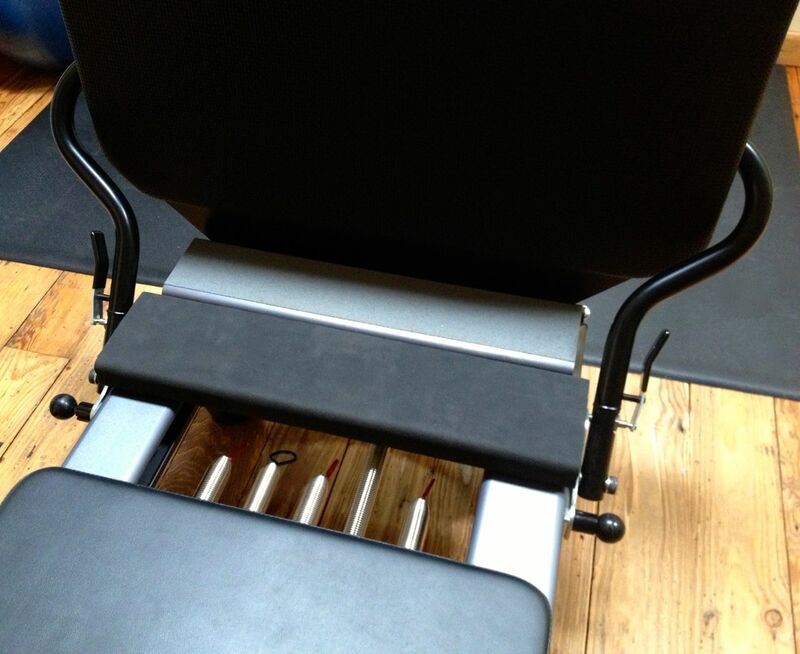 If we don't cue properly, crunches, sit ups and basically all Pilates exercises can backfire. In a few words, let's not spread this misleading information around. 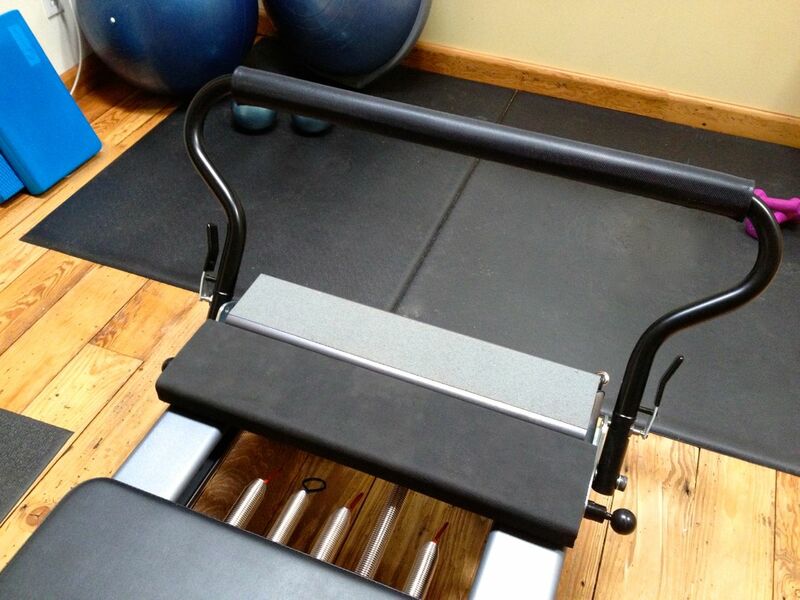 Let's take on the responsibility of teaching our clients all exercises safely taking into consideration EVERYTHING. We should teach every single exercise as accurately as possible, keeping a sharp eye on our clients and thus keeping their pelvic floor, back, knees etc safe! How about this: think twice before you cue or neglect to cue next time. Cue and explain putting each exercise into context that the client can understand and relate to. Exhale, connnnn-tract! Work through both diaphragms. Engage those abs and as a bonus, work through your pelvic floor focusing on tonality as you access your deepest abdominals! A couple of weeks ago, I decided to put my Pilates core to the test by having fun and attending my first "organized" cycling event, Giro Di San Diego Gran Fondo. Oh, it was amusing alright, but only in retrospect. Here's my email exchange with the Tobias Panek, the man who calls himself the owner of the event. Have fun! The results are finally up, but lots of KOM/QOM times missing. Are you still working on the lists? This was my first event of this type and I worked so hard getting ready for it, and of course during the event itself (even thought I was with one of the groups that got lost! We did an extra 13 miles before turning around). Regardless, even after being lost, I pushed myself to make my personal best time for the climb. I can't wait to get my QOM! I am glad you enjoyed the route. It was the best the county let me do this year. We had a lot of trouble with people stealing signs. It was terrible that happens. Aside from the confusion I am having more trouble with the organization that did the timing. They said they could do the job but in the end they could not. There is a lot of data missing. I have posted what I could on the climbs. I can not get any more data. I am very upset too. Next year we will have a different company and electronic timing to ensure there are no missing times. I apologize for not getting your time. I was wondering if you even read what I wrote. I simply wanted to know my climb time. I never said I enjoyed the route. I may have, had A. the route not changed from 65 to 72 miles (almost too much for me) and B. the signs been moved, which also resulted in additional miles. My friend was in the Gran Fondo. He was going to make the first wave, but we almost got our car towed, because the streets were not properly marked. We both watched the first and second group leave. There were people with blue aaand green wristbands. So, before my friend left with the third wave, I asked if I could leave with them. I was told "no". By now, the second wave was also clearly mixed, Gran and Medio. I was told that they were allowed to go because they hadn't asked. Really? So, I waited, being penalized for asking. I went up the hill to grab a coffee, when one of the volunteers grabbed my arm and exclaimed that I obviously hadn't followed the directions (what directions? ), and that my wristband was too tight (according to the experienced volunteer my wrist was going to swell by 2 inches). Before I had a chance to respond, she had cut it off me. So, I waited for another one. She came back with a blue (gran fondo). I asked for a green (medio fondo, my event). She said they didn't have any more green, and that all I needed it for was to eat; wrong! She put the blue one on me so loosely that it fell of my not-yet-swollen wrist. She replaced it with a bright pink one (piccolo fondo) . I objected, explaining that I had put my life on hold to train, so that I could join the Medio group, and I still wanted the green. There were only pink ones left... I rode mostly alone because of that. Right after the first rest stop, it looked as if I was lost. Nobody cared to help out. I finally joined a group a couple of miles before the missing "BarNham" turn--I told them I was with the Medio Fondo. BTW Try to find BanNham on google maps, in Escondido. The group and I were miserably lost, we discovered 6.5 miles later. Some kept going straight, but two of us wanted to stay on course. All I wanted was to be able to finish and to get timed on the climb. So, the two of us rode back. We finally made it to rest stop 2 where there was no cold water! Regardless, I was geared up, I was going to do the climb I set out for! So, a few sips of bathtub-temperature water later, I took off. I didn't know where the climb started, but it didn't matter. I left rest stop 2 and didn't look back. I pounded on those pedals. I tried to use my brain, my legs, my core . . . I used everything I had to make the climb, and even on the way down, I went faster than I have in my entire life--just in case it was part of the timed climb. I made it safely back to rest stop 2, exhilarated, hurting, but feeling accomplished to almost get run over by oncoming traffic, since the rest stop was at an admittedly poor spot. Still, I could NOT wait for my QOM score! It was all worth it. I rode past rest stop 1 this time--lots of us did. It was not clearly marked. Luckily, by then, my friend was returning from Palomar, caught up to me, and had cash on him. He took me to the nearest convenience store, about 10 miles down the road, where we bought cold water and coca colas. Eight hours later after I started, I made it back to the finish line. I used up my last bit of energy to yell my number. "We don't take numbers any longer," a male volunteer said to me. I paused. I told him that surely he was kidding, since it wasn't even 4 pm yet (courses allegedly closed at 6:30pm). Finally, in order to get rid of me, he said that the volunteers at the top of the hill were taking down our numbers. I got to the top of the hill, and said my number again. "We don't take numbers here," another volunteer said to me, "only at the bottom." I explained to her that I didn't care where they took down numbers any longer, and that somebody just had to. Finally, another lady wrote down my number on a piece of paper, while another was trying to force one of your medals over my helmet (it didn't fit). I tried to recover and to think positively. I went to eat, courtesy of my bright pink wristband. "May I have the Fontina pasta, you advertised on your site?" I asked. "What is Fontina?" was the response I got. I asked for some plain pasta. I got a bit of wilted salad on the side and a bread roll with no butter. A guy sprinkled grated cheese, about a quarter of a teaspoon over my tasteless mushy rigatoni. I just looked at him. He pointed to the bowl that he was holding on his other hand and shrugged, "We're rationing." He had a point; there was barely any left. Oh well, at least a long tough day ended with a lovely Ai-talian "Gourmet" "Feast"! So, Tobias, to sum things up, I would appreciate your consideration for reimbursing me for my entry. Between my friend's and my entry ($203.16), our room at the Official Ride Hotel ($180), we spent $383 for your first event--not counting the convenience store which was clearly a major inconvenience, rather than a significant financial burden. We also went out to dinner supporting local areas. I also turned down work. I do not have unrealistic expectations: the entry fee reimbursement would be enough, not to make me feel better, but to make me feel like less of a loser. Having said all that, I would like to add what my friend suggested to your volunteers. Get the local Chamber of Commerce to back you up. As your event keeps growing, so will local business. I many not be able to say I'll join you next time, but I in the end, I do wish you well. I hope that next year you'll be much better prepared so that the event is a success for all parties involved, especially the Riders. PS: I found the latest little "disclaimer" at the top of the "Results" page to be unconvincingly feeble and to a certain extent inaccurate. Thank you for your detailed accounting of the day. This feedback is extremly useful to me as these are the things that go on that I don't see running the event. I did not mean to imply that this is our first time running events. As it is listed on our website, we also ran the GranFondo San Diego this past April and the Sea Otter Classic GranFondo for the past 2 years. Both events are 3X the size of this event. However they have both been running for 4 years, so you get an idea of where the problems are and what needs what. Like parking and such. So being the first year, with any event, it is the hardest to foresee. What I have found running events is that it is difficult to coordinate the 200+ people required to do the job. Most of them are volunteers too. With the new event I had a lot of new staff. Many of which will never work for me again. The course marking, food quality and timing were my biggest issues this year. Getting this "new" event off the ground was extremely challenging. Many of the issues on the road were because the county required me to use a route I did not want. The rest stops were in poor places because I had limited options this year. The county does not start the detailed review process till 30 days away. When issues come up that you don't know there is no time to do anything. Hence a big issue with new events. Going into next year I know now what the issues are with the county and how to get around the problems. This is why we are going to get our route as shown on the website. Only for this reason I would encourage you to come back next year. The route will be way better and I will have ice at all the stops. Your situation with the volunteers is interesting. Thanks to your comments I will know better what to monitor, how to staff and train. I am sure the event will run more smooth next year. I can not offer a refund as this first year was an investment to get started. I would be happy to offer a 50% discount for you +1 other for next year. I stand corrected; this wasn't your fist time running events. I would not brag about it though. In any case, I wasn't really expecting a refund, I did however hope that you would say something more along the lines of: Your money went to a good cause (support Rivers of Hope perhaps). Lesson learned again; I have no expectations. Finally, thank you but no-thank-you for your counterproposal to my request for a refund. I will not be buying three instead of two entries to support your investment, besides you cannot refund one's sweat and disappointment. At this point, I decided that I was done with Tobias and his giro. I never got a straight answer or a proper apology. Never mind, the rest of my life was calling. I hope my little experience at the Giro Di San Diego entertained you. As for Tobias, he's heard of the saying, "Any publicity is good publicity". More importantly, what can one expect from a cyclist who can't even keep himself on course? It's like asking the blind to lead the blind. I'll stick to Pilates and my beloved studio. 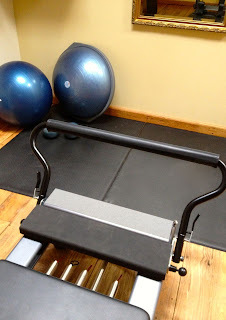 After 25 years of suffering from chronic back pain, I threw away the pain meds, the ice, and my cane and got on a Reformer. Soon after, I was transformed. Out of gratitude, I decided to become a Pilates instructor. I want to help others achieve a better quality of life.